The best way to prevent your dresser from becoming cluttered is by using skills learned by playing Tetris. In our homes, we have different pieces of furniture and other areas reserved for storage. These include our closet, pantry, desk, and of course, dresser drawers. Personally, my dresser is full of smaller items I’m unable to hang up or fold, like socks and gloves. There are also items I like to have close by, including pajamas. While I made it a point to organize each drawer around specific items, there’s always a point where this particular space becomes home to what many of us would call a “junk drawer.” After one junk drawer pops up, the rest of them quickly become disorganized and cluttered as well. We often push things around in search of one specific pair of socks, and then we tend to toss in clean clothes haphazardly after finishing up the laundry. We all live busy lives, so it makes sense that our dresser drawers can get a bit messy. 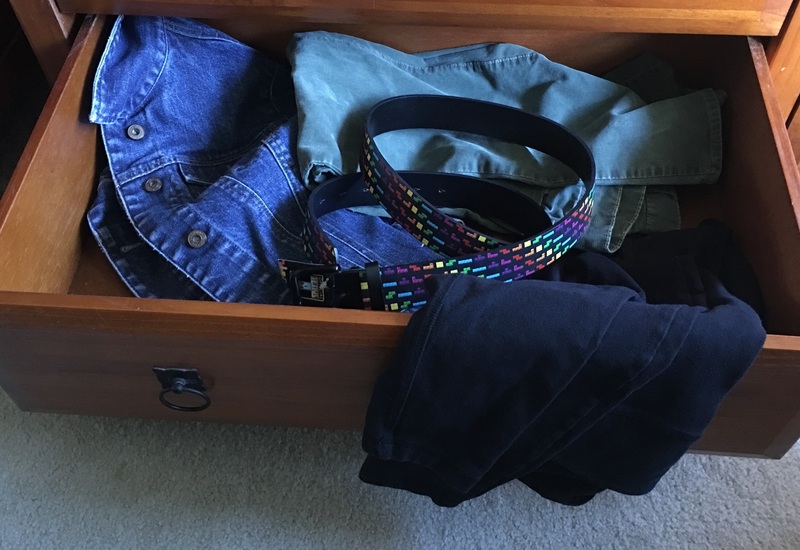 Fortunately, the skills learned through playing Tetris can help us not only keep our dresser drawers neat and tidy, but also help us keep them that way. To begin organizing your dresser the Tetris way, you’ll want to remove everything from each drawer. As you’re taking items out, you may be surprised to find that missing sock you’ve been looking for. Oh, so that’s where it went! At this point, it helps to mentally transform everything into sets of Tetriminos in order to avoid distraction. Group your socks with other socks, pajama bottoms with other pajama bottoms, etc. Once everything has been removed, it’s time to start planning where to place your Tetriminos. Organizing a dresser the Tetris way can be a bit harder than a closet or pantry because your Tetris Matrix is sectioned off into individual drawers. However, don’t let this confuse you. Instead, think of each drawer as its own Tetris line. Start with the top drawer. Here, you’ll want to put the Tetriminos you use the most like socks and undergarments. Try to keep some space between each pair of socks and avoid stacking too many items on top of each other. 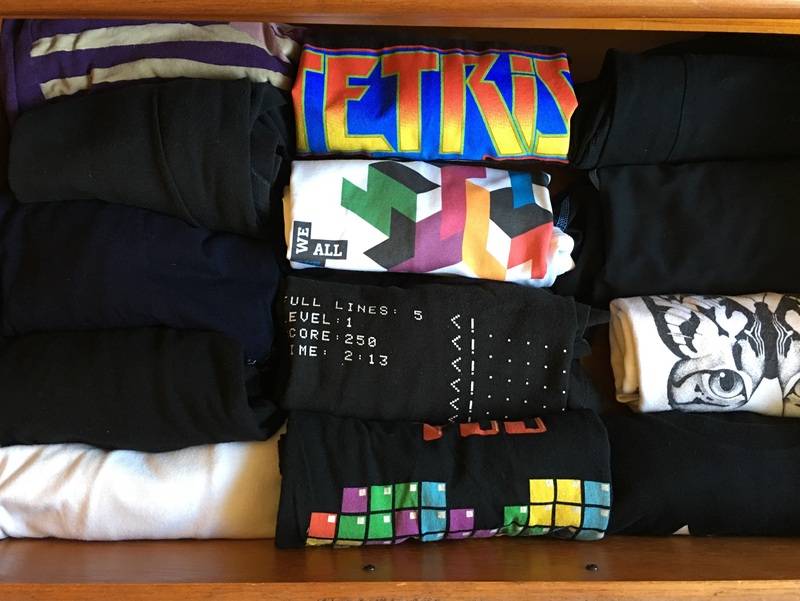 Just like Tetris, if your stack reaches the top of the Matrix, you’ll have a hard time clearing lines or you may “top out” meaning your socks will not let the drawer close. In the event you need to stack items like socks, try ditching the sock ball type of fold. Instead, get creative. For example, I like to tuck the top of my socks into one another, and then fold the pair into a neat square. Now that I have my sock version of the O-Tetrimino, I can stack them together. To make things easy to find, group similar colors of Tetriminos together, like your black trouser socks on one side and your cute striped socks on the other. Follow this pattern for each drawer, remember to give your Tetriminos breathing room, and avoid building your Tetris stacks too high. In the end, you’ll want each drawer (Tetris Matrix) to be set up so that each Tetrimino is easy to find. And, when you retrieve a Tetrimino (clear a line), you don’t disrupt the rest of your stack. It may take a little practice to perfect, but after a while, you’ll have a fully functioning game of dresser Tetris. By spinning it into a game, you’ll no longer feel the need to toss in clean clothes or rustle around for things. With your mind focused on Tetris, you’ll naturally start playing the game every time you open your drawer to retrieve a pair of socks. Plus, it also gets your brain thinking about other areas of your home that you can transform into a Tetris Matrix! For inspiration, check out our how-to feature on organizing your pantry the Tetris way. Or, if you need a Tetris break before you tackle another area of your home, click here to play Tetris!